The type of music you choose to put on your Halloween playlist has a lot to do with the type of Halloween party you are hosting as well as the guests who will be attending. Be aware of your audience and their specific tastes, and you are sure to have a playlist that will appeal to guests of all ages. The following is a list of popular songs that often make a Halloween party music playlist. Before you choose these songs, however, be sure you listen to them to determine if they are appropriate for your party guests. For example, while "Monster Mash" would be fine for a group of elementary students, you might want to avoid using any Marilyn Manson tunes. Bobby Picket - "Monster Mash"
DJ Jazzy Jeff - "Nightmare on My Street"
Marilyn Manson - "Voodoo People," "You Spin Me Right Round"
Misfits - "Day Of The Dead," "Die Monster Die," "Ghouls Night Out," "Halloween," "Monster Mash," "Pumpkin Head," "Some Kinda Hate"
Nine Inch Nails - "Dead Souls"
Ozzie Osbourne - "Zombie Stomp"
Alan Parsons Project - "The Raven"
Charlie Daniels Band - "Devil Went Down to Georgia"
Concrete Blond - "Vampire Song "
Creedence Clearwater Revival - "I Put a Spell on You"
Dave Mathews Band - "Halloween"
Edgar Winters Group - "Frankenstein"
Eels - "Beloved Monster," "Friendly Ghost," "Teenage Witch"
Grant Lee Buffalo - "Dixie Drugstore"
Jane's Addiction - "Paint It Black"
Jimmy Fallon - "Halloween Medley"
Natalie Merchant - "Sympathy For The Devil"
Oingo Boingo - "Dead Man's Party," "Weird Science"
Ramrod - "Ghost Riders in the Sky"
Rocky Horror Picture Show - "Hot Patootie," "Science Fiction Double Feature," "There's a Light""
Rolling Stones - "Sympathy For The Devil"
Screaming Jay Hawkins - "Whistling Past The Graveyard," "I Put a Spell On You"
Stevie Ray Vaughn - "Voodoo Child"
Sublime - "Under My Voodoo"
The Cure - "Burn," "Lullaby"
The Residents - "Hello Skinny"
Tim Curry - "Wild And An Untamed Thing"
Tom Waits & Primus - "Coattails of a Dead Man"
Tom Waits - "Cemetery Polka," "Everything Goes to Hell," "Hang Me In A Bottle"
Virgin Prunes - "Baby Turns Blue"
Voodoo Glow Skulls - "Closet Monster"
Warren Zevon - "Werewolf In London"
White Zombie - "I'm Your Boogie Man"
Some of these songs are fun, and some are actually quite spooky. Some you can dance to, and some are great for actually scaring your party guests. As you make your list, consider what is actually going on during your party. Are guests simply mingling and enjoying the treats you've prepared while they meet and greet, or do you want to set a darker theme to coincide with darkened rooms and ghoulish decorations? 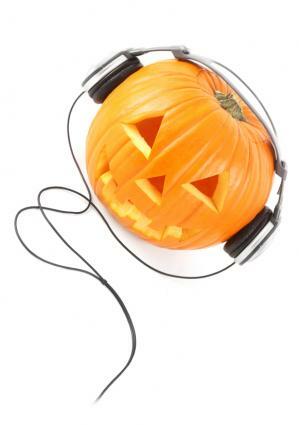 Have fun creating your Halloween music playlist. Choose songs that are fun for you and are sure to be a hit with the guests at your next Halloween party!